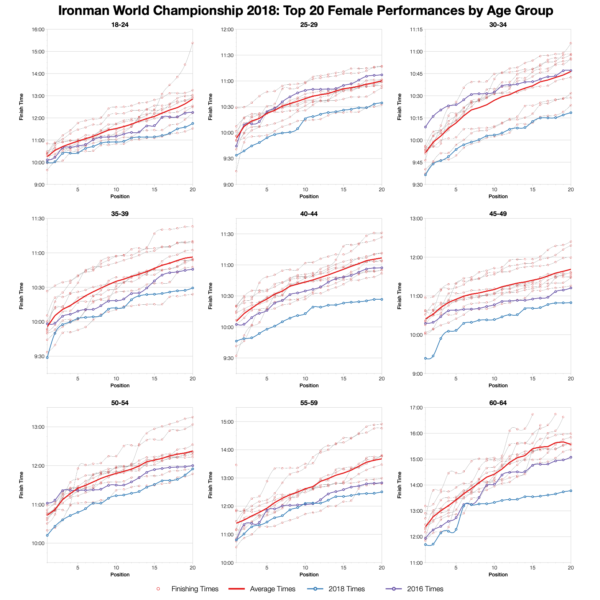 Results are in from the 2018 Ironman World Championship in Kona so here’s my analysis of age group performances at this year’s race. From the available results it appears that, once again, the field grew in Kona with almost 2,400 competitors making the start line. 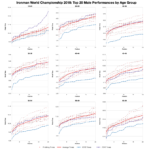 The Kona course isn’t the easiest, but times always trend fast thanks to the highly selective field. 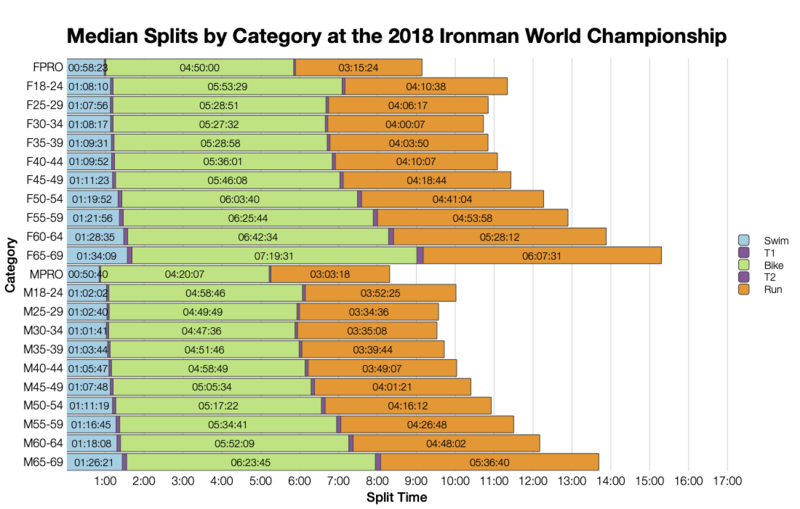 That selection process is obvious from the results distributions – the heavy skew towards fast times at each split of the race and in the overall times. 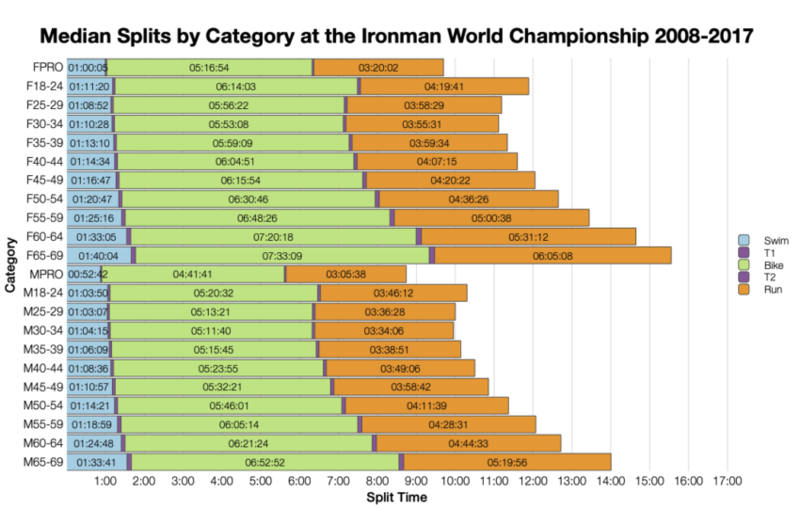 Of note this year is the faster swim and bike splits. Remembering we’re comparing with amalgamated data that incorporates a range of conditions on the course, both swim and bike was clearly faster. Run trends a little slower though, but not enough to stop the overall times coming in faster. Conditions do appear to have been quite favourable this year. 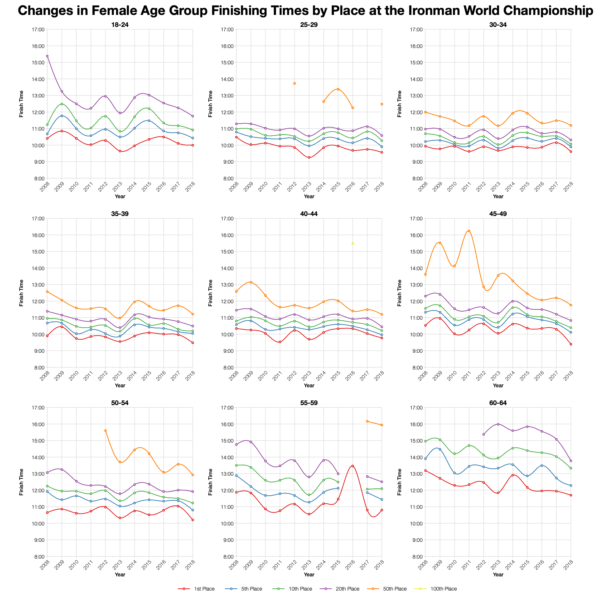 Although DNF figures are generally low in Kona, this years are particularly low. It’s worth noting that some of the previous years will likely mix DNS and DNF numbers together boosting the figures a little for sims and overall. We can also clearly see the growth in the number of athletes over the last decade in the figures. 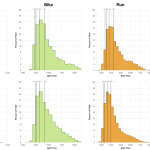 Median trends reflect those shown in the distributions – clearly faster bike medians and slower run medians for most. This years race appears to have had good conditions for biking as medinas are about 20-25 minutes faster for many age groups. About a quarter of the field come from the US with the rest spread around the world. 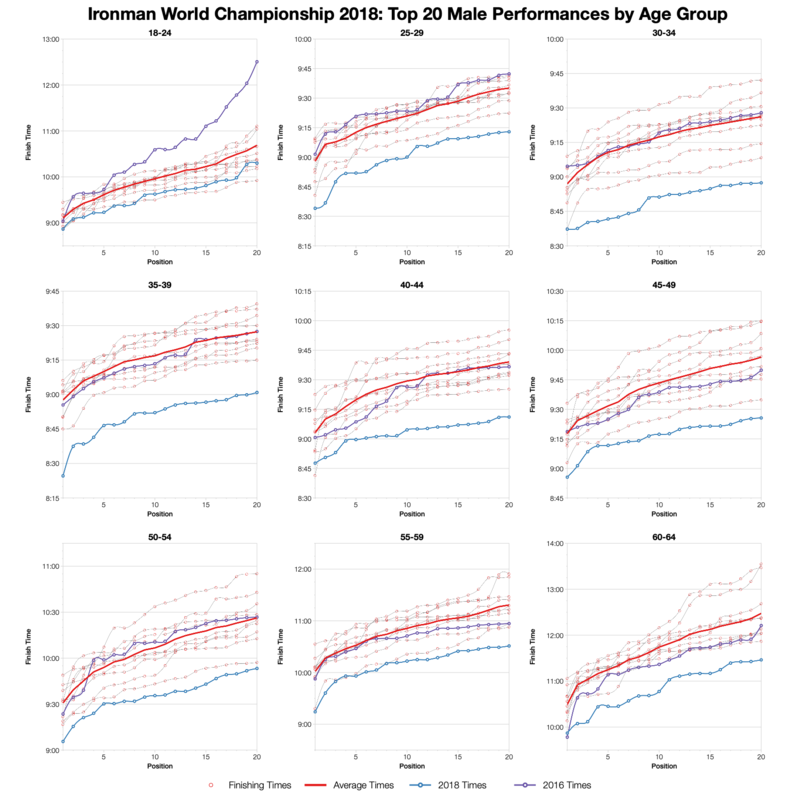 Age group winners also tend to come from the US too, although not proportionally. 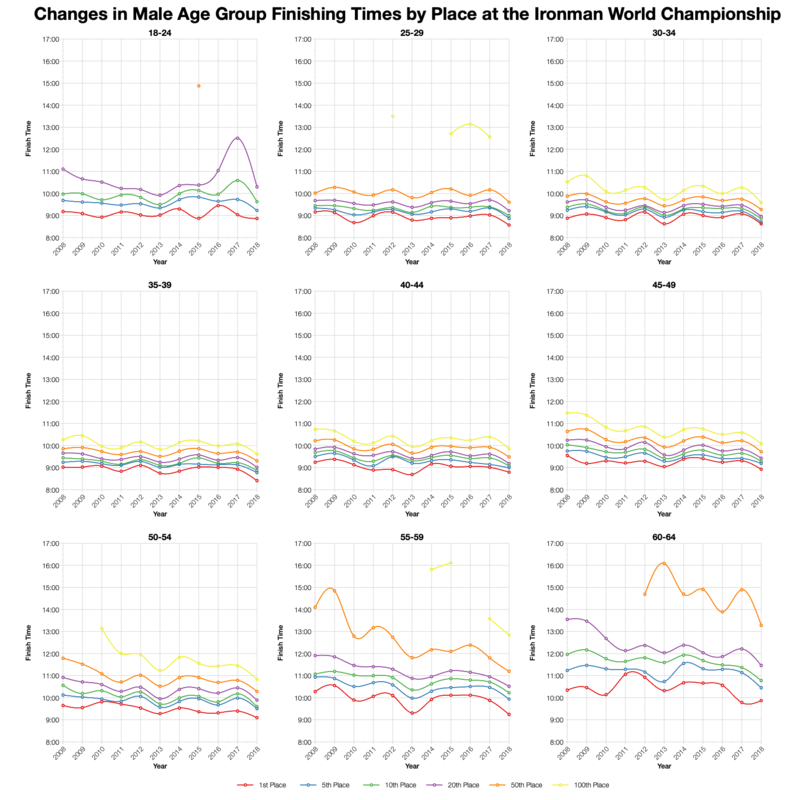 There’s fluctuation in age group finish times by position over the years, generally within a small range, but definite ups and downs. This year shows the marked improvement in times for specific places that the other charts have shown so far. 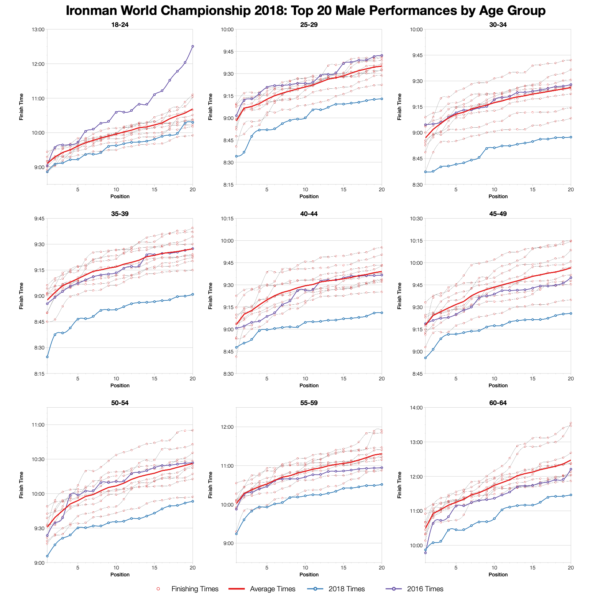 These are the age group winning times for major age groups finishing at Kona. Although it’s not clear from the Ironman website, age group winners have also received Kona slots for the following year in the past. You can compare this with the Kona averages and other race on my Kona qualification page. Not many races will have so many significant sub-9 hour age group winners. 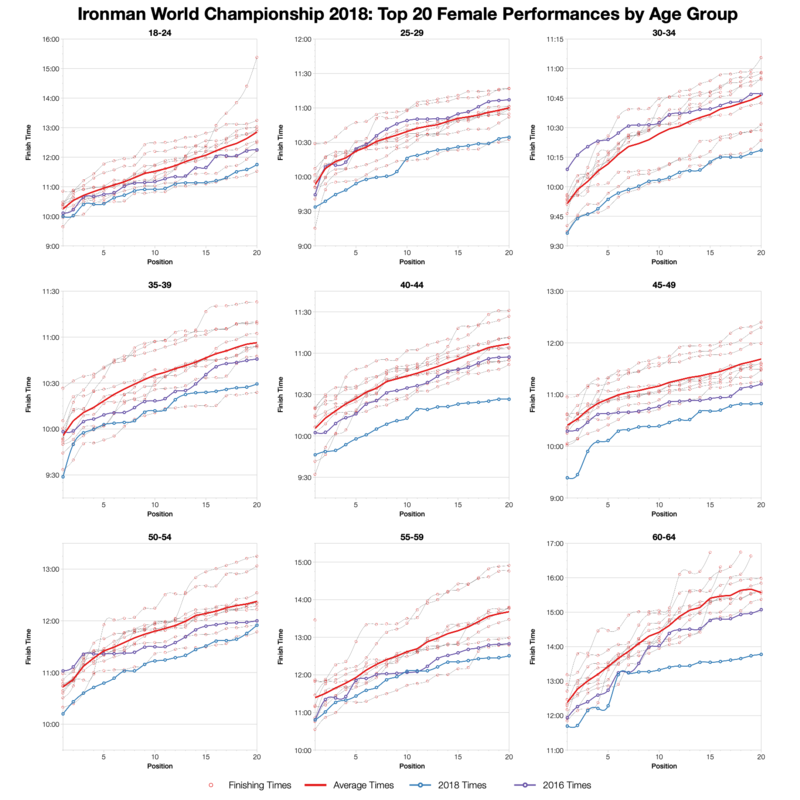 The age group top twenty times universally trend faster than the average and most of the previous years. There have been some faster times in previous years, but not many. 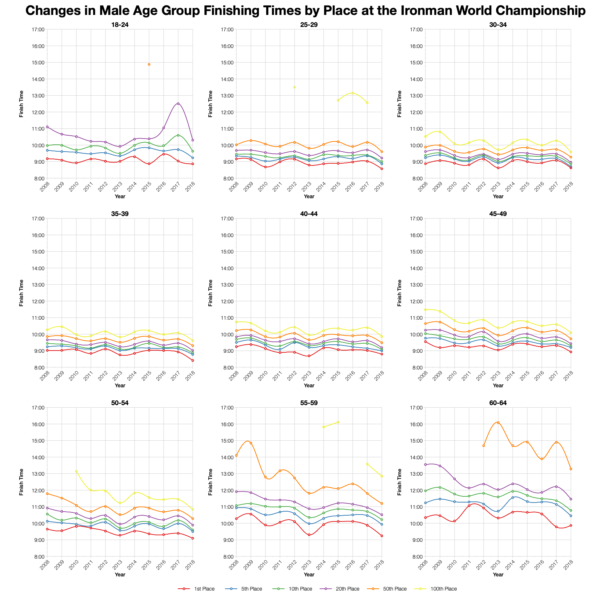 Again, it’s very clear that this years race results trend at the fast end of Kona times. 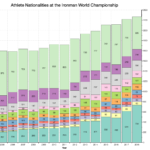 You can access a spreadsheet of the full results from the 2018 Ironman World Championship on my Google Drive.